Welcome HOME to Sienna Estates in Bentonville School District located just in Centerton. Sienna Estates offers a community pool/playground/park and clubhouse! 251 Asboth Drive features 3 bedrooms, 2 full baths, granite counters, fenced large backyard (corner lot), 1634 ht.sq.ft. and is gorgeous! WELCOME HOME! 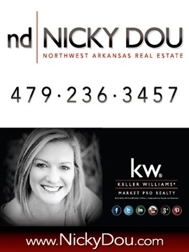 Call Nicky Dou today for your personal tour of this wonderful home. For sale for only $150,000!